Margaret and Brian, the sweetest couple from New Jersey, chose the Metropolitan Building for their summer wedding. To the untrained eye, Long Island City seems like an unlikely place for an elegant wedding day. The Metropolitan Building is tucked amongst a sea of dingy warehouses and is a true gem that has become one of the most popular wedding venues for stylish couples in New York City. 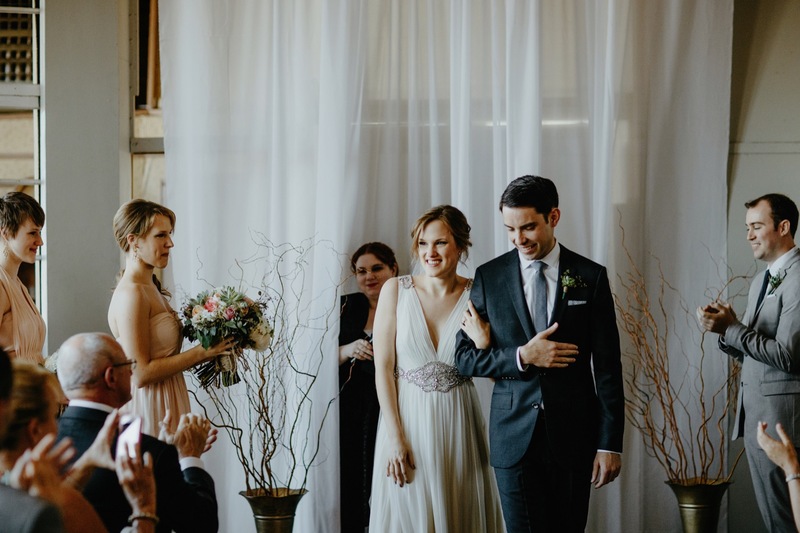 A Polished Plan truly pulled the space together with thoughtful details that transformed the space to reflect the vision that the couple had in mind. Margaret chose one of my favorite dresses by all time by Jenny Packham that worked really well with the raw feel of the venue. Amanda Thesen did a really amazing job accentuating Margaret's natural beauty. The couple did a first-look, which gave us plenty of time to photograph portraits of them and the bridal party. One of the highlights of the day was their intimate ceremony of the second floor of the building. Last but absolutely not least, Scratch Weddings really brought the party. I hope these photos allow you to live vicariously and feel as though you are a part of this Metropolitan Building Wedding. A Metropolitan Building Wedding by wedding photographer, Sidney Morgan, based in California & New York.